Nothing can bring the family together (or perhaps push it apart) like a good games night, and today's high-tech games leave the likes of Monopoly and Scrabble looking distinctly dated. If you want to upgrade your family fun nights, you've arrived at the right place. Whether you're into miniature motor racing or trivia quizzes, we've got something for you here, and adding some tech to the mix doesn't have to cost you much – especially if you've already got a games console, smart speaker, or smart TV box you can make use of as well. 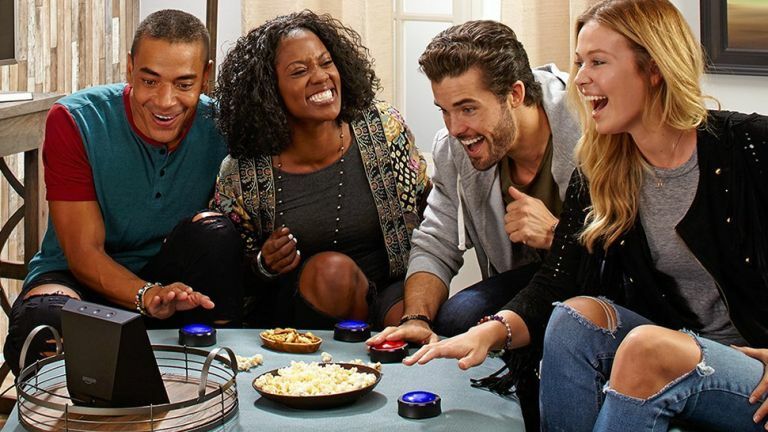 If you've got an Amazon Echo of some description in the house, then you can make use of Echo Buttons, brightly lit buzzers for playing a variety of games – just ask your speaker, "Alexa, what games can I play with my Echo Buttons?" to hear the full list of available titles. There's Trivial Pursuit Tap, for example, where you can bash the buttons to respond to questions, or Button Monte, which is a sleight of hand game. Everything works wirelessly and it's a fun and intuitive extension to your Echo, with Buttons coming in packs of two. You and up to three other family members can race around customised tracks with Anki Overdrive, which is like an upgraded version of Scalextric with an extra dose of AI – AI that can power the cars around the circuit if you don't have enough humans to drive them. As well as the extra smarts inside Anki Overdrive, you can create all kinds of custom tracks, and play a variety of different challenges, with everything controlled via an app on your phone. Different packs and cars are available, so you can keep on adding to your setup. With the proviso that you need to already have an Apple TV up and running, as well as at least one iPad or iPhone in your house, Sketchparty TV is a fantastically entertaining party game app that will test the digital drawing skills of your family and friends to the limit. It's just like Pictionary – whoever's turn it is to go has to draw something on the mobile device while the rest of the team guess what it is. The drawing is beamed up to the big screen via the Apple TV, so everyone can get involved and watch the timer count down. Who's the best movie buff? As in, "seen it", get it? This game comes with a DVD which you use to test your movie knowledge, covering hundreds of film clips and stars, and deploying special randomising DVD technology so you don't get a repeat of the same questions over and over again. If you don't like this original Scene It, then you can find a whole host of other editions online as well, covering Friends, Star Trek, Disney, Harry Potter and plenty of other film franchises and shows. This version of the game supports between two and eight players. If you've got a PlayStation 4 at home then Knowledge Is Power, developed by Sony itself, is a fun title to grab for trivia addicts. Everyone in the family can get connected via the accompanying phone and tablet app, which is used to control the on-screen avatars. Although it's based on the simple idea of the fastest correct answer winning, there's enough variety and interesting side games to keep everything interesting, and it really is a game that the whole family can get involved with (up to six people can play at once). One of the more innovative hi-tech gaming experiences we've come across in recent months, Beasts Of Balance is played with wonderfully crafted physical animal pieces that you stack on top of each other, plus a smart app running on your iOS or Android phone. The end result is an engaging experience for players of any age, where you try and build as tall a tower as possible without everything coming crashing down. As you add new pieces on the table top, the virtual world you see on your phone changes and evolves as well.